History and nature are well preserved and on display at Parker Mill Park. The Washtenaw County park straddles Fleming Creek just above it’s confluence with the Huron River west of Ann Arbor and US-23. The county-owned portion is a 26-acre tract that includes the historic grist mill, a pioneer log cabin and the old millpond site. An adjoining 18 acres is Forest Park, a dedicated natural area. Together the parks create a 44-acre preserve that are linked by 1.5 miles of trail. The main attraction of the county park is Parker Grist Mill, the last of at least five mills that operated along Fleming Creek. Built in 1873, the mill originally ground flour and corn for the Parker family and neighbors but by 1887 a second building was added to press apples into cider. The mill was kept in operation until 1958 and the original milling machinery was still operable when the county took over the historic buildings in the late 1970s. Today the mill is one of the oldest surviving structures in Washtenaw County and open for public tours on the weekends in the fall. Though the mileage is limited, the Hoyt G. Post Trail makes for an interesting escape from the urban scene that is Ann Arbor . The trail is a 0.6-mile long handicap accessible boardwalk that begins near the grist mill and then winds along the banks of Fleming Creek to the Huron River. Along the way you pass five interpretive areas. Also within the park is Bituminous Path (also labeled Main Trail), a paved path that links Parker Mill Park with the City of Ann Arbor's Gallup Park by crossing the Huron River. 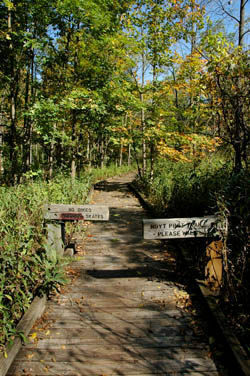 The Bituminous Path provides access to the start of the Hoyt G. Post Trail as well as to a foot bridge used to reach the Sugarbush Trail, a 0.2-mile loop on the north side of Fleming Creek. The outing described here is a portion of the paved path and Hoyt G. Post Trail that are commonly combined for a round-trip hike of 1.4 miles. The Bituminous Path is popular with cyclists and inline skaters but only hikers are allowed on Hoyt G. Post Trail. At the east end of the parking area an asphalt path departs from the information pavilion and winds around the grist mill as it descends to the Fleming Creek. Continue south (right) on the Bituminous Path to quickly pass the foot bridge to Sugarbush Trail and a pioneer log cabin. In less than quarter mile you reach the well marked start of the Hoyt G. Post Trail. From here an impressive boardwalk trail takes over, skirting the banks of Fleming Creek. You quickly pass four interpretive decks, three overlooking the creek, that have signage explaining everything from how glaciers formed the terrain to why streams change course of over time. 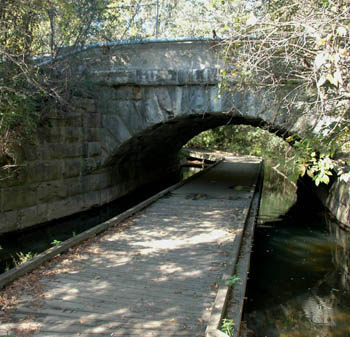 At Mile 0.4 you reach the most intriguing section of the trail, where the boardwalk swings over Fleming Creek and passes underneath a limestone-arched railroad bridge. You’re literally walking over the middle of the creek. On the south side you enter Forest Park that protects the low-lying forest floodplain of the Huron River. This could be a muddy stretch but the boardwalk keeps boots and wheelchairs clean and dry. 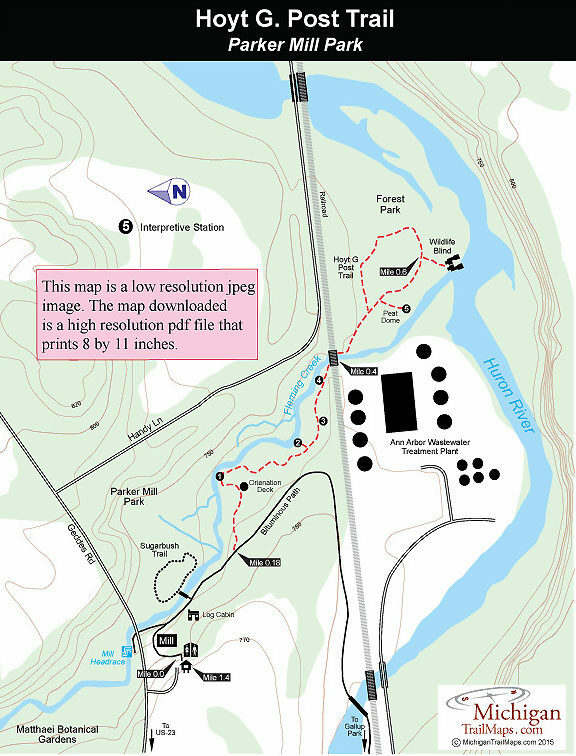 When the trail splits, head right and you’ll come to the spur to the fifth and final interpretive station. This one is built on top of a 100-foot wide peat dome, which is an unique floating wetland community that is lifted by artesian springs. At Mile 0.6 you arrive at the spur that leads to a wildlife blind overlooking the confluence of Fleming Creek and the Huron River. From the blind, the boardwalk loops back through the forested floodplain to the junction passed earlier, At this point you head right and retrace your steps to the historic grist mill and parking area, reached at Mile 1.4. Near the parking area is an information pavilion with interpretive display panels, rest rooms and a drinking fountain. 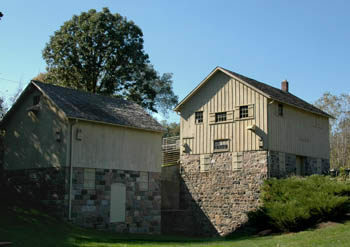 The park also contains the Parker Mill, an operating grist mill. Fall tours of the mill demonstrates how grain was processed utilizing water powered equipment, from the grinding process to the finished product. Parker Mill Park is open from 7 a.m. to 8 p.m. throughout the year except in the winter when the hours are sunrise to dark. Public Grist Mill tours are available during most September and October weekends. There is no fees to hike the trails or for tours of the mill. From US-23, east of Ann Arbor, depart at exit 39 and head east on Greddes Road past Dixboro Road. The park is just beyond, on the south side of Geddes Road. Contact the Washtenaw County Parks and Recreation Commission (734-971-6337; www.ewashtenaw.org/urls/parks).